A deliciously healthy alternative this Pancake Day on Tuesday 5th March. Preheat your oven to 200°C. Rub a little oil over your salmon fillets, wrap in foil and place on a baking tray. Bake for 15 to 20 minutes, until mouth-wateringly flaky. Combine the eggs, milk and salt & pepper in a bowl, then whisk. Begin to sift in the flour, stirring as you add. Sprinkle chives into the mixture. Heat the butter in a frying pan over a medium heat, so it covers all the pan. Pour some of the mixture into the pan, enough to make a small to medium sized pancake. Cook for 2-3 minutes, until the mixture starts to bubble. Flip and cook for another 1-2 minutes, until the pancake is golden brown. Set aside. Repeat until all the mixture is used. Drop your asparagus into slightly salted boiling water, cover and cook for 3-5 minutes. Remove and set aside. Remove salmon from oven and season with salt & pepper. Stack the pancakes and the asparagus, placing the salmon fillet on top. Sprinkle extra chives and a squeeze of lemon over the dish. 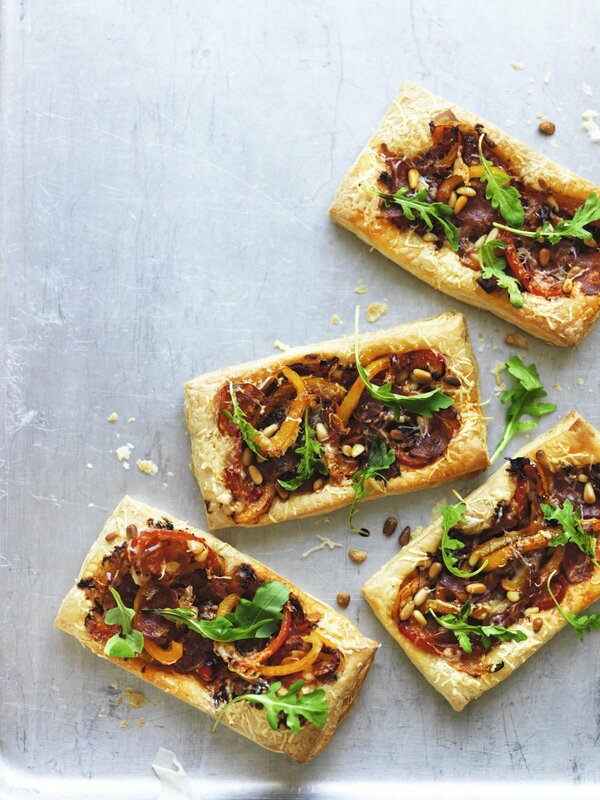 Finish with a delicious drizzle of chilli sauce. Top tip: For a fuss free meal use The Saucy Fish Co.’s Frozen Salmon with Chilli, Lime and Ginger Dressing, which comes with its own easy oven bake bag. Pick up today from Ocado. We always love a recipe that takes just half an hour to prepare. Just what you need mid-week after the commute home. Add finely chopped chilli with the garlic for some heat. For a meat-free version omit the bacon and scatter with Brie or goat’s cheese before grilling. Put the black rice, water and salt in a saucepan and bring to the boil. Cover and reduce heat. Simmer for 40 mins until rice is cooked. Drain. Stir fry the baby kale with a little rapeseed oil for 2 mins. Slice the green onions into very thin slivers, then segment the oranges. Reserve any juice. Put the rice, kale, pomegranate seeds, spring onions and chopped walnuts into a bowl and combine. Stir in any reserved orange juice. Put the rapeseed oil in a nonstick frying pan and turn heat to medium-high. Reduce heat, season the salmon and add to pan. Cook for 5-6 mins. Gently flip the fillets and cook until the flesh is nicely coloured, about 1-2 mins longer. Top with salmon and drizzle a sauce of your choice over the top. Sprinkle with chilli flakes and serve. Top Tip: Drizzle The Saucy Fish Co.’s brand new product, Saucy No. 5 over your salmon. Made using four potent aphrodisiacs - pomegranate, vanilla, chilli and champagne – the sensual sauce promises to get your pulse racing. Available free of charge from: https://shop.thesaucyfishco.com. Recipe courtesy of SupergoldenBakes, using Saucy Fish salmon. A perfect excuse to end dry-January early! Burns night on the 25th January (that’s tomorrow!) is honoured each year with haggis, whisky, poetry and renditions of Auld Lang Syne. So we thought you might like this quick and easy recipe to help the party go with a swing. 1. Remove the outer casing from the haggis, break up into 24 pieces and roll each piece into a small ball. 2. Place the flour and paprika in a shallow bowl, the egg in another shallow bowl and finally the breadcrumbs in a third bowl. Roll the haggis balls in the paprika flour, then in the beaten egg and finally in the breadcrumbs until evenly coated. Transfer to a baking tray and chill for 10 minutes. 3. Meanwhile, stir together the mayonnaise, wholegrain mustard and whisky. Spoon into a serving bowl and set aside. 4. Pour vegetable oil into a medium saucepan to a depth of about 6cm. Heat until it reaches 170ºC or drop a small piece of bread in the oil – when it turns brown in about 30 seconds, the oil is ready. 5. Using a metal slotted spoon, lower the haggis bon bons, a few at a time, into the oil and cook for 2-3 minutes until golden and crispy. Drain on kitchen paper and keep warm in a low oven while you finish cooking the remainder. Cook’s tip: This recipe also works well using vegetarian haggis. With only a few more days to go until Christmas, we thought we’d have a look back at some of our favourite sweet recipes that will not only go down a treat at this time of the year, but would also make fabulous gifts too. From Cook Yourself Happy - The Danish Way - by Caroline Fleming. 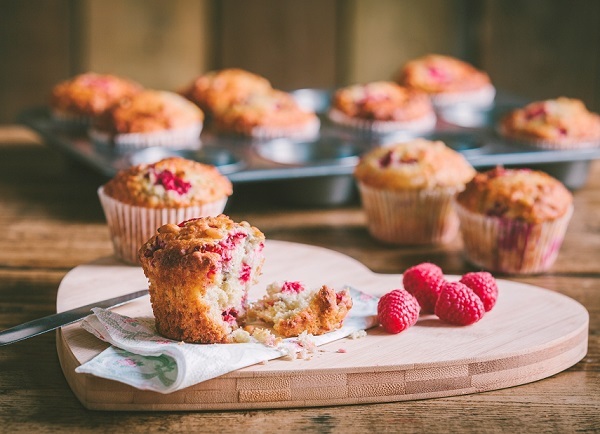 Courtesy of newspaper columnist and much–loved television baker Candice Brown who has published her book Comfort: Delicious Bakes and Family Treats. This vegan & gluten free recipe will impress your guests for the upcoming Christmas season. Preparation time: 30 minutes. Cooking time: 35 minutes. 1. Bring a saucepan of water to the boil, add the potatoes and boil for 5 minutes (no need to peel them first). Rinse in cold water to cool the potatoes. Coarsely grate into a large bowl and stir in the fennel seeds, shallots and seasoning. This can be prepared a day ahead. 2. Drain the artichokes, reserving 3 tbsp of the oil. Stir 1 tbsp oil into the potatoes. Heat another 1 tbsp of oil in a large frying pan. Place a 5cm round cookie cutter in the pan and put a heaped dessertspoon of the potato mixture inside the cutter. Pack down firmly with the back of the spoon. Carefully lift away the cutter and make more rösti circles with about half the remaining mixture, spacing them slightly apart. Fry for 5 minutes on each side until golden. Transfer to a baking parchment-lined baking sheet and fry the remaining mixture in the same way using the remainder of the oil. 3. Spread a scant ½ tsp of the tapenade onto each rosti and top with a piece of artichoke. Sprinkle with the mozzarella, cover loosely and chill until needed. 4. To serve, preheat the oven to 180°C, gas mark 4. Bake the rösti for 10 minutes until heated through. Garnish with coriander sprigs. 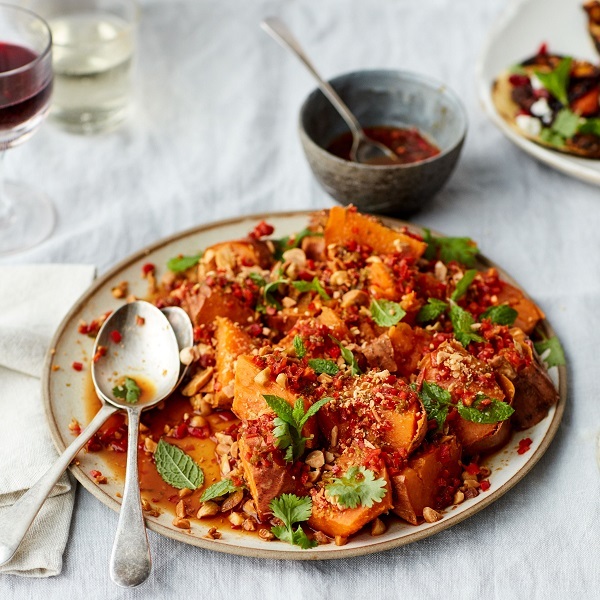 If you’re on the lookout for a healthy Autumnal lunch or supper we have just this dish for you. This salmon, kale and beetroot salad packs plenty of flavour and crunch and is off the scale healthy-wise too! Preheat the oven to 280C. Blend the tarragon with breadcrumbs and add salt and pepper. Once blended, stir in butter. Heat 1 tablespoon of oil in a large pan and sear two salmon fillets over high heat for 2 minutes, skin side up. Flip the fillets and top each with the crumb mixture. Transfer the pan to the oven and bake for 10 minutes, or until the fish is cooked through. To make the salad, massage kale with a little olive oil, then combine with red onion, beetroot, mint and cashew nuts. Combine 50ml of olive oil, lemon juice, crushed garlic and black pepper, and drizzle this mixture over the top of the salad. Dish out salad and top with herb crusted salmon fillets, pour the lemon butter sauce over the top of the fillets and then sprinkle with pumpkin seeds and black pepper. TOP TIP: For fuss free fish and sauce, straight from the freezer, try The Saucy Fish Co.’s Herb Crusted Salmon with Lemon Butter Sauce. Available at Ocado. 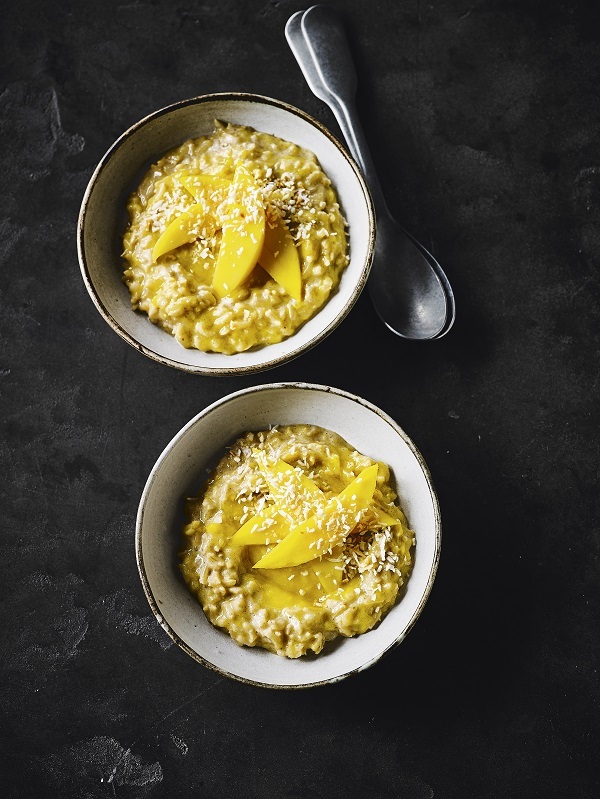 In need of a breakfast recipe, to cure your hangover and compliment a builders cup of tea? We can sort you out, with this wholesome smoked haddock kedgeree recipe that is jam-packed with flavour! Don’t tell anyone, but we like it for supper too with a nicely chilled glass of crisp white wine. 2. Add rice and 600ml of water to the pan and bring to the boil. Reduce heat and cover for 10 mins. Add in peas, and cook for afurther 2 mins. 3. Meanwhile, put the smoked haddock and bay leaves in a frying pan. Cover with the milk, and poach for 10 mins. Remove the haddock fillets from milk and cut into small pieces. 5. To make your sauce, melt the butter in a saucepan and add the flour, whisking for 1 min. Combine the milk and cream, and add to the saucepan slowly, whisking until thick. Add in an egg yolk and cook for 30 seconds, on low heat. 6. Next, add in the cheese to the sauce mixture and stir. Add the cinnamon and season. Remove from the heat. 7. Once sauce is completed, peel the boiled eggs and cut into quarters. Combine the fish, eggs, rice and peas together. Add the sliced chilli and drizzle the cheddar and chive sauce over the top. Sprinkle a little parsley before serving. To celebrate National Burger Day today, Mindful Chef, the UK’s number one healthy recipe box delivery service, has teamed up with like-minded Hally’s, a Californian-inspired restaurant located in Parsons Green, to create the ultimate plant-based burger. Full of flavour, the Mindful Chef “inside out tofu burger” will be available at Hally’s today. Call 020 3302 7408 to make a reservation. Cut the block of tofu in half horizontally to form two slices and cut a circular piece of tofu from each. In a bowl, mix the chilli sauce, tamari and maple syrup. Place the tofu in the marinade, coat with the sauce and leave while you prepare the edamame patty. Finely chop or grate the garlic and ginger. Thinly slice the spring onions. In a bowl, mash the edamame beans with a potato masher until roughly mashed. Heat a frying pan on a medium heat with 1 tsp of the sesame oil, add the ginger, garlic and spring onion and cook for 3 mins until softened. Place this mix into a large bowl, then add the mashed edamame beans, matcha powder, chickpea flour and sweet white miso paste. Form the mix into a burger shape around 2cm thick. Heat the same frying pan with 2 tsp sesame oil on a medium heat and cook the burgers for 3-4 mins each side until golden brown. At the same time, in the same pan, cook the portobello mushroom for 2-3 mins each side until softened. Heat a separate frying pan on a medium heat with 2 tsp sesame oil and cook the tofu for 5 mins each side, until turning golden. Brush with the remaining marinade and sprinkle over most of white sesame seeds. Peel the cucumber into long thin ribbons and place in a bowl with vinegar. After 10 mins, remove from the vinegar. Julienne or spiralize the carrot and mix with the kimchi. Mix the ingredients together for the sweet chilli sauce. Assemble the burger - place a slice of tofu as the bun base, then place the portobello mushroom on top, then the edamame patty, then the kimchi carrot, then layer over the pickled cucumber and sliced radishes. Drizzle over the sweet chilli sauce and sprinkle over the black sesame seeds. Top with the tofu bun and the remaining white sesame seeds. Hally's was opened in June 2013 by Anna Halliday who wanted to bring simple, innovative food to Parson's Green in a laid-back environment. Inspired by a road trip in California, Anna realised that the Golden State had got it right: keep ingredients fresh and well sourced, be bold with flavours and add some sunshine! From modest delis in Venice Beach to the haute cuisine of Napa Valley, Anna realised that California offers something amazing and which isn't seen enough in the UK. Anna left her Advertising job behind her and decided to set up the restaurant. Preheat your grill to medium-high. Combine oil and lemon juice in a bowl, then season. Brush the mixture over all salmon fillets, and then cut each fillet into four equal parts. Slice your peppers and onions, then prepare your skewers by alternating the salmon and vegetable slices. Grill the skewers until the salmon is cooked through, turning carefully once. This should take 8-10 minutes. 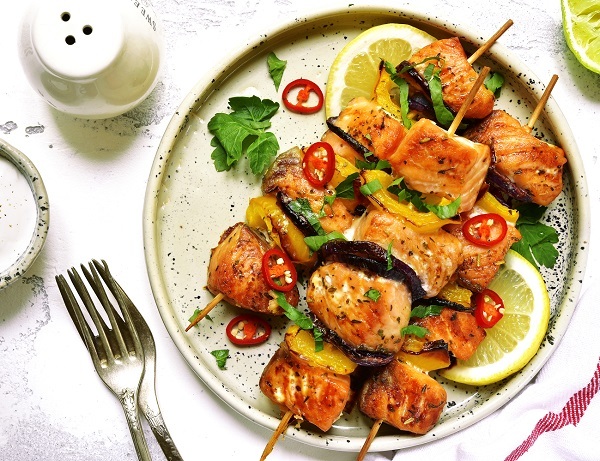 Recipe courtesy of The Saucy Fish Co. Their Ready to Eat Lemon and Herb Salmon with Lemon and Dill Mayo is perfect main ingredient for these protein skewers. 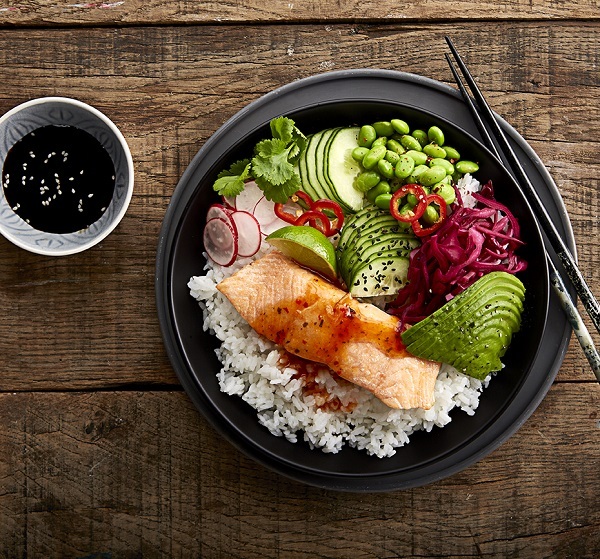 Have you perfected a poke bowl yet? This food trend that is all over Instagram originated in Hawaii and is usually a raw fish salad often served as an appetizer or sometimes as a main course. Not only does all that sliced, cubed and layered raw veg look pretty as a picture - it's just about the healthiest thing on a plate. This version is made with cooked salmon but it's still got our vote. Place the salmon in the oven for 20 mins. Once cooked through, remove and set aside. 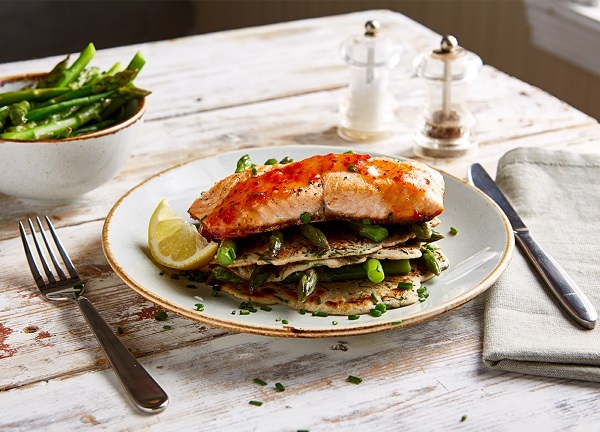 Recipe courtesy of The Saucy Fish Co., using their Salmon with Chilli, Lime and Ginger Dressing – available in the freezer aisle of Tesco and Sainsbury’s. 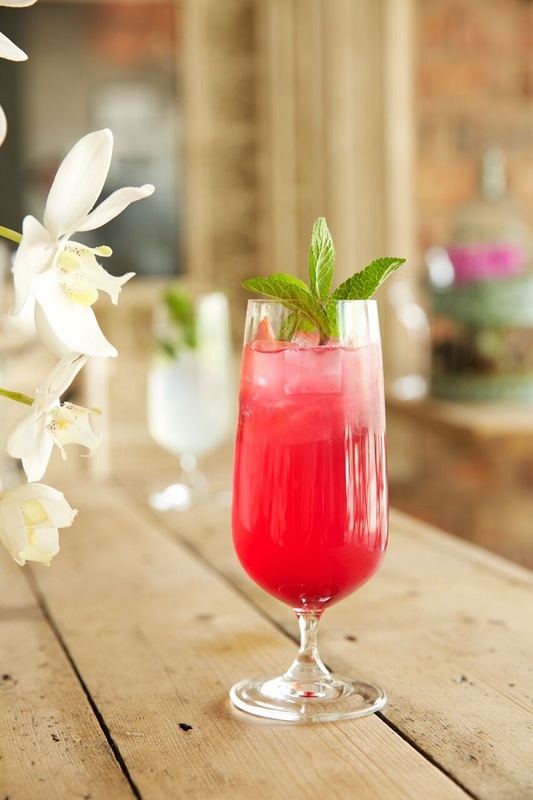 Nothing says summer like the chink of ice in a glass and a refreshing well made cocktail. Best served outside! Both recipes are courtesy of Giggling Squid - who serve staggeringly good Thai food prepared by master Thai chefs. Known for their popular tapas menu at lunch with an extensive menu in the evenings. 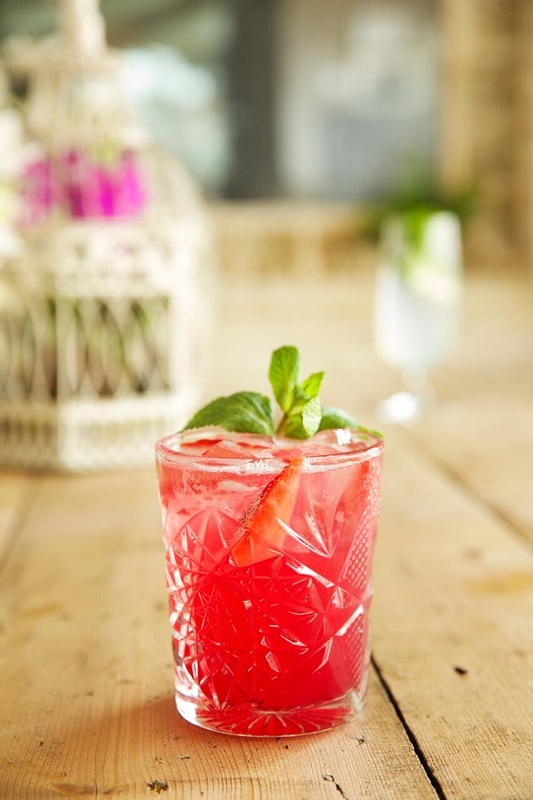 This week's recipe is from The Habit at the South London Gallery and is the perfect combination for a summer treat! Set within one of Camberwell’s stunning Victorian buildings and art space, Head Chef John Hollins (Formerly of Trinity, Clapham and The Goose, Oxford) has created a menu which has a sense of nostalgia and will be sure to transport diners back to childhood years. Make a paste with yolks & sugar. simmer cream & milk, then whisk all ingredients together. Return to a medium heat, continue stirring until mixture thickens. Pass through a sift & chill. Per 500 mil of juice you’ll need to soften 3 sheets of gelatin. Juice 20 blood oranges, add half the juice to a pan & bring to a boil, once boiling, whisk in the softened gelatin, then add the rest of the juice. This will allow the jelly to cool & setting process will be quicker. When setting the jelly add the seeds from one pomegranate. Cream together sugar & butter, then gently beat in eggs, zest, flour & baking powder. Extract from the brand new Brick Lane Cookbook by Dina Begum, with contributions from street food traders and restaurants including Beigel Shop, Blanchette, Chez Elles, St Sugar of London, Cafe 1001 and Moo Cantina, Brick Lane Cookbook is a culinary map of the East End’s tastiest street and a snapshot of London at its multifaceted, chaotic, crazy best. I first discovered brown butter on holiday in France when I made it to add to a cake. I was so delighted with the results that I rushed to show my friend excitedly. ‘Look! Butter has almost turned into caramel!’ Who knew such alchemy? Back in London I decided to experiment further with brown butter, adding it to biscuits and tart shells – I was convinced browning butter was absolutely the best way to eat it. I decided to make mini bundt cakes using my mum’s old tin and, of course, brown butter had to feature in the recipe. The colour of these little cakes reminded me of the golden flakes of baklava pastry, so I’ve added a Middle Eastern twist with a rose-scented icing. One of these is never enough so double up the recipe if you’re a greedy sort like me.- Dina Begum. Place the butter in a stainless steel pan on medium heat (you need to be able to monitor the colour of the butter so you don’t burn it). The butter will begin to foam after about 30 seconds. Cook for a further three or four minutes until it starts to smell nutty, almost caramel-like. You will begin to see small particles of milk solid at the bottom on the pan. Once done, take the pan off the heat and leave to cool for about ten minutes. Now preheat the oven to 180C (160C fan). Generously grease your bundt tins, dust with flour and shake off the excess. When the butter has cooled, transfer to a mixing bowl and cream together with the sugar, salt, ground almonds and vanilla and almond extracts. Whisk the eggs in a small bowl, then beat them into the butter and sugar mixture. Pour in half the flour and mix thoroughly, then add the milk and remaining flour. Mix until you have a smooth, thick batter. Divide the batter between the bundt rings, filling them to about a centimetre from the top. Bake for 15 to 18 minutes or until lightly risen and pale gold. If you’re anything like me you’ll find the scent of freshly baked cake irresistible and will want to dig right in but don’t, unless you want broken halves of warm sponge in your hand! Let the cakes cool completely in the tin for about an hour, then run a thin butter knife around the edge of each cake and ease them out. Place the cakes on a baking rack or a flat dish and prepare the icing. Put the icing sugar in a small bowl and add the pink food colouring, two tablespoons of milk and the rosewater. Mix together to make a pretty pink icing, runny enough to drizzle – if it looks too thick add another tablespoon of milk. Top each cake with a teaspoon or so of the icing, gently coaxing drips down the sides. Top with some flaked almonds and serve with a fragrant cup of masala tea. 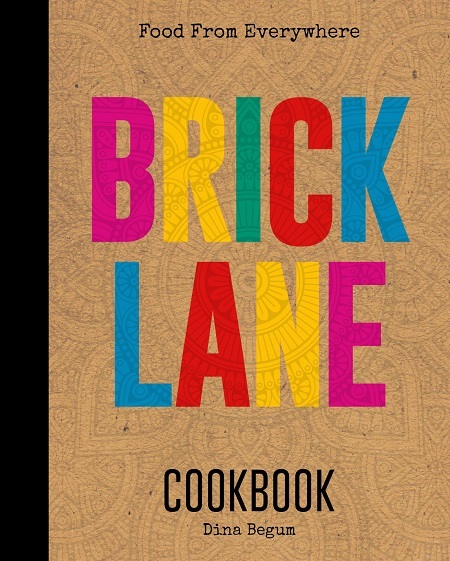 Brick Lane Cookbook by Dina Begum is published in hardback by Kitchen Press, priced at £20. 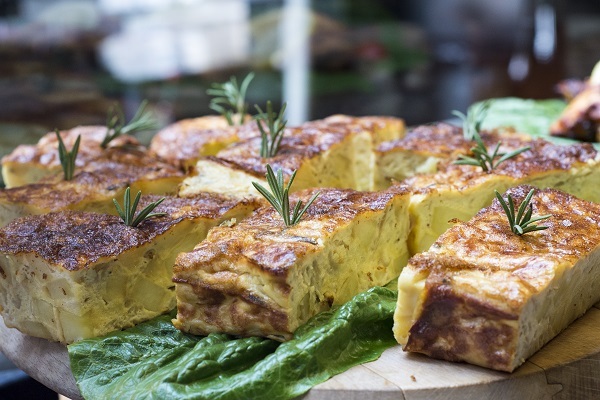 Tortilla is an easy Mediterranean favourite and a popular dish on the Café 1001 menu. This baked version of the classic Spanish potato omelette is flavoured with rosemary and gently caramelised sweet onions and I love it. Make sure to cool your potatoes before adding to the egg mix; otherwise you’ll end up with scrambled eggs. - Dina Begum. First make your sweet onions. Pour the olive oil in a frying pan over low heat. Add the sliced onion and bay leaf and cook for 40 to 45 minutes, stirring occasionally, until the onions have reduced and are completely soft and lightly browned. You’ll end up with about four heaped tablespoons of sweet, caramelised onions. Set aside to cool. Throw the potatoes into a bowl and mix with the salt. Set aside for ten minutes. Heat the vegetable oil in a deep pan over a high heat (140C) – test it’s hot enough by dropping in a piece of potato which should start sizzling immediately. Deep fry the potatoes for 12 minutes or until golden and tender, then drain and leave to cool for at least 15 minutes. At this point preheat your oven to 180ÅãC (160C fan). Whisk the eggs in a mixing bowl and add the cooled sweet onion mixture, rosemary and black pepper. Throw in the fried potato pieces and mix well. Line a deep baking dish and pour in the mixture. Bake for 25 to 30 minutes, or until the tortilla is golden brown on top and cooked in the middle. Test it’s done by inserting a small knife or skewer in the centre – if it comes out clean your tortilla is ready. Cool for ten minutes before serving. I’ve seen people’s eyes light up after a single bite of this cake and even those who don’t normally eat cake are usually converted. Of everything I cook, this is the thing most requested by family and friends. I first created it for a Bengali-inspired afternoon tea and wanted to share the recipe for this book as it’s such a wonderful way of showcasing spices in a dessert. The cake layers are reminiscent of fragrant masala chai and the frosting is inspired by rasmalai, the famous Bengali milkbased sweet, flavoured with rosewater and cardamom. 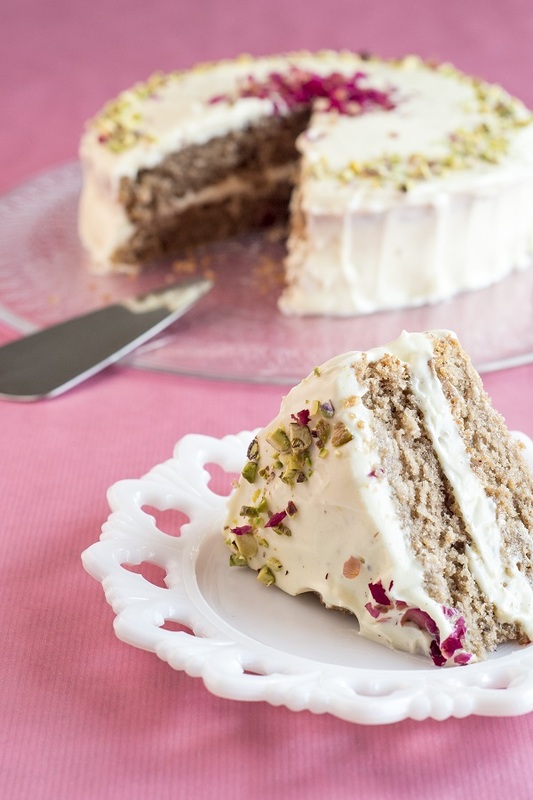 Make it as an extra-special birthday cake, decorated with vibrant pink rose petals and pistachios, or as a perfect finish to your next dinner party. For best results, you need a handheld electric mixer or a stand mixer to make the cake, but you can do it with a whisk and some elbow grease. - Dina Begum. Preheat your oven to 180°C (160°C fan) and grease and line the cake tins. Steep the tea bags in 100ml boiling water, stirring for a minute to extract as much of the flavour as possible. Discard the teabags. Add the ground cardamom to the tea and stir thoroughly, then set aside to let it infuse – this gives you a really fragrant batter. Make your buttermilk next: pour the milk into a glass and stir in the vinegar. Let this sit while you start on the cake batter. In a large bowl, cream together the butter, sugar and vanilla with a handheld mixer until light and fluffy – this will take at least two minutes. If you’re using a non-electric whisk you’ll need to beat the mixture for longer. Add the cinnamon, ginger and yoghurt and beat for a further minute, then slowly beat in the tea and buttermilk. Put the flour in a separate bowl with the baking powder and salt and quickly mix with a whisk. Add the flour to the buttermilk, butter and sugar mixture in two or three additions, then whisk for about 30 seconds until everything is well combined. Make sure not to overmix at this point or you’ll lose the lightness in the cake. Put the egg whites into a clean mixing bowl. Beat with a clean whisk until they form stiff peaks – five minutes or so (longer, if non-electric). Gently fold the egg whites into the cake batter until evenly combined and pour it into the prepared tins. Bake for 25 to 30 minutes, or until a toothpick poked into the middle comes out clean. Cool completely in the tins on a wire rack. When you are ready to make the frosting, beat the butter with the ground cardamom until pale and fluffy. Mix in the cream cheese, vanilla extract and rosewater, then slowly add the icing sugar and whisk together until you have a smooth, glossy frosting. Put one of the cake layers on a large, pretty plate. Using a palette knife, spread with a third of the frosting, then turn the second cake layer upside down and place on top, very gently pressing together to sandwich. Then take the remaining frosting and pile it on top of the second layer. Gently coax some of the frosting down to cover the sides, turning as you go, and smooth the rest in a good thick layer over the top. Finish the cake with two concentric circles of vibrant pink dried rose petals and crushed pistachios and dot a couple of rose petals in the centre. This cake is a stunner! It tastes best after resting in the fridge for a couple of hours, as this helps the flavours meld together and makes the cake easier to cut. Cook’s tip – you can bake the cake layers in advance. Just completely cool, wrap in cling film and put in the fridge overnight. The cake will stay fresh and moist.